Health Concerns is the leading manufacturer in researching herbal medicines and bringing the centuries-old Chinese herbal traditional knowledge to the West. Resinall K also known as Qi Li San in Chinese is an herbal supplement. This is a blend of Chinese herbs that may work to alleviate certain symptoms associated with minor injuries. Read on to know more about the Resinall K Reviews. 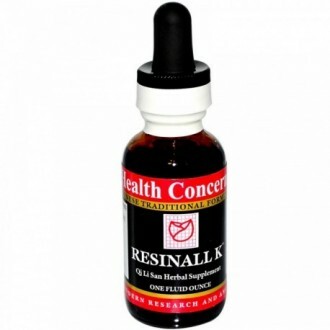 Health Concerns Resinall K is a blood-vitalizing liquid herbal dietary supplement. It may help promote tissue regeneration following traumatic injuries. Many of its ingredients depend on resinous compounds for their analgesic and healing effects. The Resinall K liquid is a proprietary combination of such potent healing and analgesic herbs like dragon’s blood (xue jie)‚ frankincense (ru xiang)‚ and borneol (bing pian) which may act to promote tissue regeneration and inhibit excess bleeding. This supplement helps address minor pain‚ swelling‚ and bruising. It is useful both topically and/or internally. It is very beneficial for people experiencing mild pain, bruising and swelling due to sprains, strains, torn tendons, bleeding, fractures, broken bones, and lacerations. In addition‚ Resinall K could potentially act to maintain healthy skin. When used topically‚ this liquid may work to relieve certain symptoms related with mild athlete’s foot‚ impetigo‚ or ringworm infections due to its gentle antifungal and antibacterial effects. Its proprietary blend contains centuries-old Chinese herbs to help with minor injuries. It is very beneficial for people experiencing mild pain, bruising and swelling due to sprains, strains, torn tendons, bleeding, fractures, broken bones, and lacerations. Its proprietary blend contains centuries-old Chinese herbs to help with minor injuries. It is effective to heal and regenerate tissue experiencing pain and swelling due to traumatic injury. It supports speedy healing of such skin disorders as dermal ulcers, eczema, and fungal and bacterial infections. It aids in coagulation to stop bleeding. It helps to nourish and invigorate the blood. Dragon’s blood (xue jie) treats hemorrhage and pain. Catechu (er cha) is cool and astringent which assists Dragon’s blood to stop bleeding and generate new tissue. Frankincense (Ru Xiang) and myrrh (mo yao) are especially useful for damaged tissues. Carthamus (hong hua) invigorates blood and may treat musculoskeletal trauma. Borneol (bing pian) opens up the channels. The alcohol serves a traditional function in an injury formula. It brings the effects of the herbs strongly to the exterior. Each bottle contains one fluid ounce of solution‚ providing about 60 servings. Internal – The recommended serving size is 15 drops (0.5 milliliters) under the tongue between meals. Hold under tongue until dissolved. External – Apply to the affected area 1 to 3 time daily. Use cotton swab or cotton ball as an applicator. There are no known reported side effects of this supplement. However, it may contraindicate in pregnancy. Thus, pregnant women should not intend to use this product. Shake well before use. The manufacturer suggests using Resinall K with tonic formula if taking for more than two weeks. Caution – it will stain clothing. People opinions about this product are – it’s natural, very effective strong topical ointment, best pain reliever helps speed up the healing process and much more. However, some people complain about the product causing stains on clothes and small size just 1oz. Mikebike is using this for over many years now. He says it is very helpful externally on cuts/scrapes or internally by mouth for an immunity boost. The only complaint he has that it will stain clothing/ fabrics badly. Grace says this is a very effective remedy but repeated applications needed. Because of stains, she uses it only when at home. Donna purchased Resinall K to help relieve chronic pain due to injuries sustained in a car accident. She is amazed to see how rapidly it works. She experiences pain abating literally within minutes. Donna gave it to her friend who was experiencing back pain. She also felt instant pain relief and inquired for the product name and ordering details. Donna’s another friend who strained some back muscles also found relief. Owing to its uses, easy application, and several positive customer reviews, Resinall K is must buy for rapid recovery from injuries.